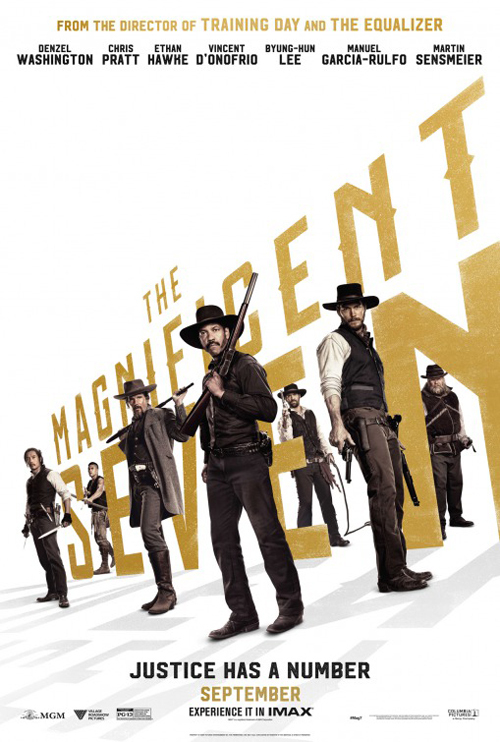 (SPOILERS) The Magnificent Seven is exactly what you’d expect from the umpteenth remake of Seventh Samurai, or more specifically the direct offspring of the 56-year-old western of the same title; it’s serviceable, undemanding, features mostly decent performances, but brings absolutely nothing new to the mix to justify itself. At least Battle Beyond the Stars and A Bug’s life wholeheartedly switched genres. At least The Seven Steptoerai… actually, no. It’s probably a better movie than its underwhelmed reception suggests, but the critical reaction is merited simply by virtue of the current glut of remakes greenlit for no other reason than that studios have the rights and money to flush away in a forlorn hope that brand recognition will be enough. Although, MGM in particular should really know better by now. That is, if they had even a modicum of creative acumen. The semi-studio appears to subsist on a diet of reconstituted back catalogue, with wanton disregard for quality. Hence the forgettable or worse likes of The Pink Panther, Fame, Carrie, Robocop, Poltergeist and Ben-Hur. Antoine Fuqua’s coming on board as director might have been the first warning sign of innate ‘s’alright’-ness; he’s a slick technician who has given us a run of middling properties, from Tears of the Sun through to Olympus Has Fallen and Southpaw. Even his best, Training Day, is somewhat overrated. He reunites with that movie’s two stars here, with Denzel Washington putting on his dependably sombre-faced face (he’s more interesting when he loosens up a bit; this is almost – but not quite; I wouldn’t be that insulting – in Bruce Willis autopilot mode) as the head of the group, Sam Chisolm, and Ethan Hawke as former Confederate sniper Goodnight Robicheaux. Fuqua’s picture, credited to Nic Pizzlolatta (True Detective) and Richard Wenk (who scribbled the effective but perfunctory big screen The Equalizer for Washington) in the screenplay department, is also a fairly fruitless dotted “i”s and crossed “t”s example of homogenised multi-cultural casting, since it only really succeeds in utilising its actors according to an antiseptic array standard tropes. Given the bloated running time, it would have been relatively easy to flesh out these characters, but Billy Rocks (Byung-hun Lee) is only really defined by his knife-throwing, and Comanche Red Harvest (Martin Sensmeier) by his arrow slinging. The latter is even laden with the groan-worthy cliché of fighting a bad seed of his tribe (Jonathan Joss; that’s Joss, not Ross, although that would alone have been worth the ticket price), whom he runs through while tutting disapprovingly that “You dishonour us”. So too the plucky broad role, Hayle Bennett (also in that Equalizer movie) showing Emma Cullen has the requisite fiery stuff in the most tiresomely repetitive fashion (Emma also, quite remarkably given her lack of arms training, manages to take out the villain from the other end of a church with a shotgun, while Chisum is in the way, strangling him). Worse, she is presented with an indigestible coda speech, droning something or other about how this lot were magnificent as we’re treated to a pan across the graves of the fallen warriors. None of the above performances are bad, but the actors are insufficiently serviced to make much of a mark. In contrast, Chris Pratt absolutely steals the movie in a way he was unable to with Jurassic World, bringing comedy chops throughout to his Dean Martin-esque drunk, card sharp and would-be ladies’ man Joshua Faraday. Less in the limelight, but still effective in that regard are Manuel Garcia-Rulfo’s Mexican member Vasquez and Vincent D’Onofrio’s high-pitched, hilariously frenzied-with-a-blade tracker Jack Horne. Peter Sarsgaard has little to crow about in respect of his pallid villain Bartholomew Bogue, which may explain why he decided to play him as an opium addict. Fuqua handles the action efficiently during the first half, albeit bringing no particular flourish to bear on his genre take. He establishes Bogue as suitably loathsome in an opening that sees the industrialist burn down the town church and shoot Matt Bomer at point blank range, introduces the seven agreeably enough, and moves right on to the most effective sequence in the picture, as the septet take down Bogue’s hired enforcers with due diligence. Unfortunately, after this the picture stops dead for what seems like an eternity. Fuqua can instil no tension into what should be a ticking clock, waiting for the arrival of Bogue and his army of reinforcements, and there is nothing in the way of character material to fill the void. This is where it becomes painfully obvious that no one, not Washington, who must coast along on charm alone, has anything to elicit our care for them as characters. And, when the showdown arrives, it’s full of bombast but lacks the clear staging and cutting of the first encounter, particularly once the town is beset by a rampant Gatling gun. Fuqua even allows some confusingly non sequitur shots, such as Chisum looking over his dead comrades, which somehow includes a full view of Billy at the top of the church bell tower. Shave off half an hour, and the movie would have been much more economical and effective (the producers probably decided that making it five minutes longer than the original made it an inherently better movie). And, if you’re going to use The Magnificent Seven theme, use the damn thing; don’t leave it for the end. This isn’t James Bond; you’re not going to get another chance with the Magnificent Eight (well, I very much doubt it). Like I say, though, this is serviceable, mostly well-acted, and at times (during the first half) clicks into an enjoyable groove that makes it clear, if any clarification was needed, that the western genre can continue on quite happily (without the need for remakes of popular titles) if only due care and attention is granted; someone should give Kevin Costner some money to make another, actually, since his last (Open Range) was terrific.